Zoltron "Sue Nami" Statue - Hand Painted TATTOO EDITION Edition of 50. The Ambiguous & Immaculate Lady of Armageddon & Natural Disaster, Sue Nami. Sue Nami was first unearthed in 2011, during the very tragic Fukushima meltdown. Poster artist Zoltron was working on a poster she took on a life of her own and her story continues to evolve. This is a high quality, heavy resin art piece that is very detailed and one of a kind! 9 Polystone Resin (resin and limestone). Hand Painted & Hand Finished. Tattoos drawn by SF tattoo artist and longtime Zoltron co-conspirator Ross K Jones. Weighs between 4 and 5 lbs. Includes new Sue Nami Sticker printed by Sticker Robot. Limited Edition of 50 pieces. Ships securely in laser cut foam box. Multiple painting techniques were used to achieve the finish, everything from hand painting, to airbrushing and transparent shadows washes, with various sheens, matte paints, gloss and semi-gloss finishes. 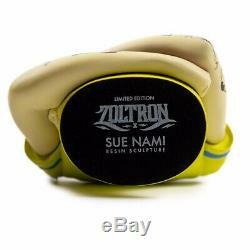 The item "Zoltron Sue Nami Statue Hand Painted TATTOO EDITION Edition of 50" is in sale since Thursday, March 21, 2019. This item is in the category "Art\Art Posters". The seller is "wilstore_0" and is located in Columbus, Georgia. This item can be shipped to United States, Canada, United Kingdom, Denmark, Romania, Slovakia, Bulgaria, Czech republic, Finland, Hungary, Latvia, Lithuania, Malta, Estonia, Australia, Greece, Portugal, Cyprus, Slovenia, Japan, China, Sweden, South Korea, Indonesia, Taiwan, South africa, Thailand, Belgium, France, Hong Kong, Ireland, Netherlands, Poland, Spain, Italy, Germany, Austria, Bahamas, Israel, Mexico, New Zealand, Singapore, Switzerland, Norway, Saudi arabia, United arab emirates, Qatar, Kuwait, Bahrain, Croatia, Malaysia, Brazil, Chile, Colombia, Costa rica, Panama, Trinidad and tobago, Guatemala, Honduras, Jamaica, Barbados, Bangladesh, Bermuda, Brunei darussalam, Bolivia, Ecuador, Egypt, French guiana, Guernsey, Gibraltar, Guadeloupe, Iceland, Jersey, Jordan, Cambodia, Cayman islands, Liechtenstein, Sri lanka, Luxembourg, Monaco, Macao, Martinique, Maldives, Nicaragua, Oman, Peru, Pakistan, Paraguay, Reunion, Viet nam, Uruguay.